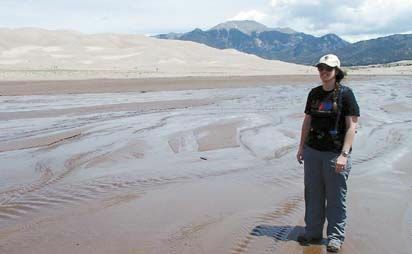 WHEN: Sunday, July 10, 2016 at 2:00 p.m.
CHEYENNE, Oklahoma: On Sunday, July 10, at 2:00 p.m., Ranger Barbara Ford will explore Great Sand Dunes National Park and Preserve in Mosca, Colorado and describe her connections to this unique landscape. Ranger Barbara spent several weeks volunteering in the park in 2014 and 2015. Cheyenne Brass Ensemble of Marci Kitchens, Amber Little, Olivia Lucas and Ashton Cockrell and the Flute Trio of Faith Bryan, Lockland Lippencott and Dixie Smith entertaining at the 2016 Alumni Banquet.